Birds of a feather flock together and that’s exactly what hundreds of colorful parakeets are doing at Parakeet Pointe: Treats for Tweets. Look for this exhibit on the second floor of the Aquarium and step into the center of all the activity! 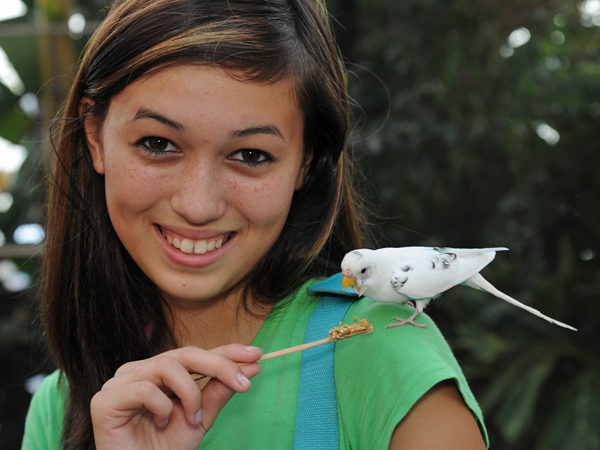 Parakeet Pointe is an 800 square-foot outdoor environment offering a memorable, interactive experience for Aquarium guests who stroll through the exhibit space among hundreds of brightly-colored parakeets also known as Budgerigars. For an even closer experience guests may purchase seed sticks and feed the birds as they walk through the free-flight exhibit. Parakeet Pointe is included with general admission to Audubon Aquarium of the Americas. Feed sticks may be purchased for $1.50 each, for Audubon members they are $1.00 each.